In September 2011 my friend Andrey Volchenko & I have decided to go to the Raduga River. First we went by car to Ust-Kamchatsk. 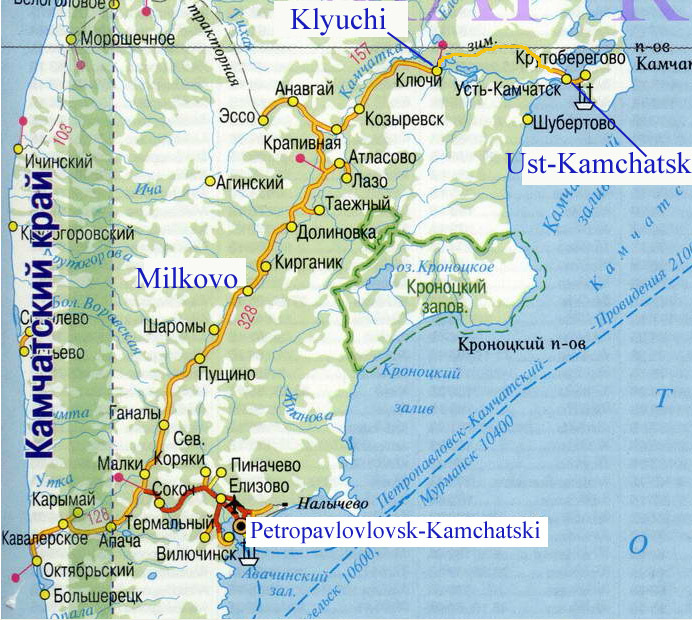 The main road of the Kamchatka Peninsula goes west and north to Milkovo (300 km), Klyuchi (570 km), and Ust-Kamchatsk (740 km). Ust-Kamchatsk is a town and port in the mouth of the Kamchatka River which is the biggest at the peninsula. 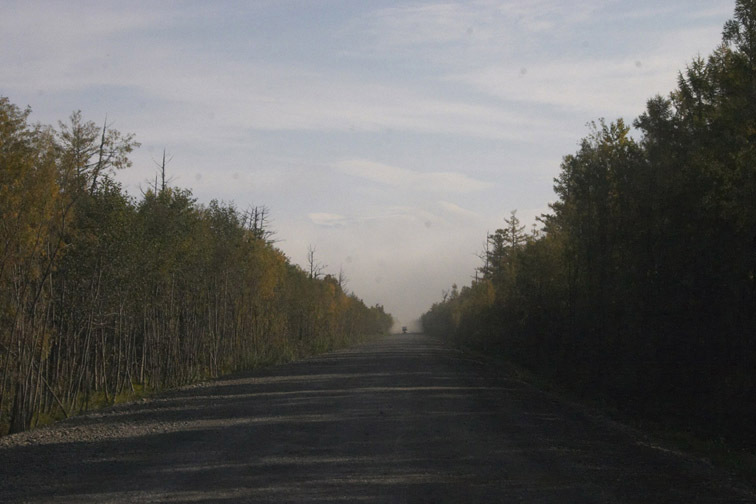 In the wide flat valley of the Kamchatka River the dirt road between Milkovo and Klyuchi is made of volcanic ash. On the way to Ust-Kamchatks the road is four times crossing the Kamchatka River (2 bridges and 2 ferries). Here you see the upper (southern) ferry. Kamchatka River is not very swift; it has deep quiet pools and sandy banks. This is a side-channel (less than 1/4 of the river). From the road Milkovo-Klyuchi one can see the volcanoes of the "Klyuchevskaya" group: Dalnyaya Ploskaya Sopka (left, 3943 m), Klyuchevskaya Sopka (middle, 4700 m), and Kamen' (right, 4575 m). The area is covered with the ash of the Tolbachik volcano eruption. Extinct volcano Kharchinskaya Sopka from the road Klyuchi - Ust-Kamchatsk. Shiveluch volcano from the road. Fresh mud flow (torrent) from the Shiveluch volcano. When active this torrent is often threatening to cut the road to Ust-Kamchatsk. New part of the Ust-Kamchatsk, constructed close to the Nerpichie Lake.